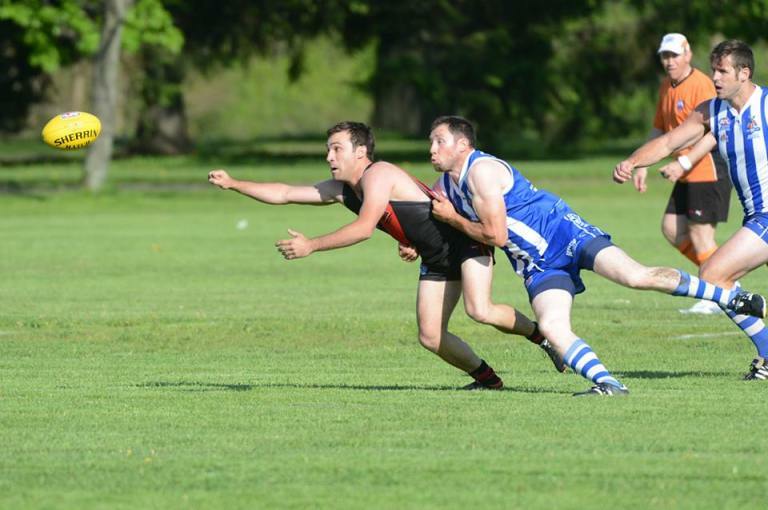 The Dingos have lost their final Friday night match of the season to the Etobicoke Kangaroos, and have dropped to 0-2. The club headed to Humber South on Friday night looking to rebound from a tough opening round loss at the hands of the Broadview Hawks. With several players making their season debuts, the Dingos were optimistic about their chances against a much improved Etobicoke squad. The match began well for the Dingos, dominating through the midfield and using the ball effectively. First-gamer Colin Turner Bloom put the red and black on the board first after taking a great mark running back with the flight of the ball. Just minutes later he converted his second goal in as many kicks from another strong pack mark. The Dingos maintained a high work-rate for the remainder of the quarter, and entered the first break having held the Roos goalless. The second and third quarters told a much different tale than the first. The Roos gained the upper hand and rebounded the ball quickly from their half-back line. Despite Tyler Pennell and Anthony O'Brien converting from set shots, the Dingos were unable to maintain their early intensity and it was not long before Etobicoke had taken the lead. Heading into the final quarter, the Roos held an 8-point lead. The red and black came out of the blocks much better than they had in the second and third quarters but were unable to convert in front of goal. Both sides failed to kick a major for the quarter, and the Roos ended up walking away 13-point winners. Tom Humphries was best on ground in his first game for the club, while Tom Evans, Andrew Anderson and Alex Aitken battled tirelessly in the middle of the ground. Tom Bell, Jimmy Duggan and Colin Turner Bloom were also amongst the best for the red and black, but it was the work of the Roos backline that proved the difference at final siren.